Our obsession with Cornwall continues! If you’re a regular reader you’ll know we hang out there a lot – like, several times a year. But there was one type of break we’d not tried before…until recently. If you’re looking for lodge holidays in Cornwall then you’re going to want to read this review of Waterside Resort near Bodmin. 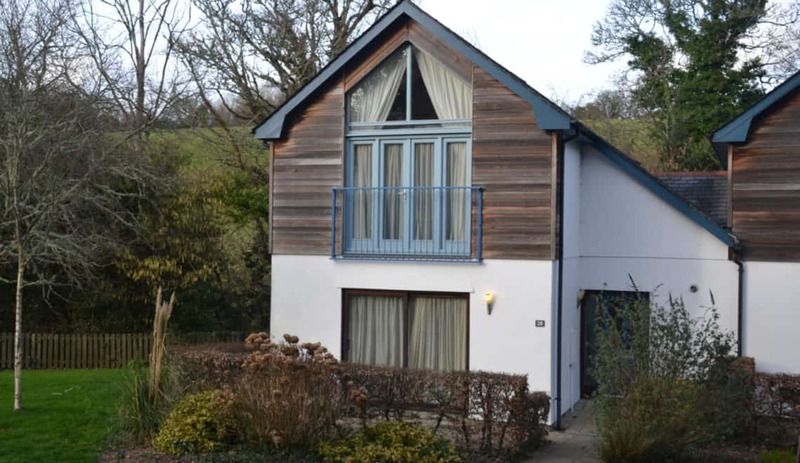 We were invited to check out their Cornish holiday lodges during a weekend in November. Mr Tin Box was due to be away with work so I invited along Tin Box Nana and Grandad for a multi-generational short break. As it turned out Mr Tin Box was able to join us half way through the weekend so it became a family reunion too. Waterside is a landscaped holiday park set in the rugged Cornish countryside. It has own leisure complex, fishing lake, tennis courts and plenty of outdoor activities including foot golf, Segways and cycling. As well as catering for resort residents its restaurant and leisure facilities are open to the public. The Waterside holiday resort is easily accessed from the Bodmin Bypass on the A30. If you’re travelling South just come off at the junction before Cornwall Services and cross over the dual carriageway. The postcode will take you to the resort entrance on Old Coach Road. Thanks to some rough weather and clogged roads we arrived much later than expected. Luckily the resort reception is part of the club house, which has its own stylish cafe, bar and restaurant, so opens late. Tin Box Nana and Grandad arrived before the girls and I so picked up our lodge keys from the friendly reception team. We stayed in lodge 41 which had three bedrooms; one with twin beds and two doubles with en-suites. There’s also a double sofa bed in the lounge allowing the lodge to accommodate up to eight people. You can see a full tour of the lodge in my Instagram Story highlights: look for ‘Waterside’. The lodge heating was on when we arrived so it was toasty inside. Stepping in from a damp and breezy evening was a welcome treat as we began to unpack and explore. The master bedroom had a spa bath and separate shower with multiple shower heads. This was the room everyone got most excited about and the girls insisted on using before bed on the Saturday night. They thought the spa jets were a good giggle. Unfortunately, some previous guests had let the bath overflow so the room’s decor was slightly tarnished by dark water stains on the floor. Otherwise the master suite as spacious and extremely comfortable with lots of storage and it’s own TV. The second double bedroom, which Tin Box Nana and Grandad, used was a smaller room but only in comparison to the master bedroom. It came with storage and an en-suite with a shower. The girls shared the smallest room which came with twin beds and a wardrobe. It was perfect for kids. They also had sole use of the family bathroom on the main corridor. This had a shower over the bath. Each bathroom came with toiletries and we had plenty of hand and bath towels. The rooms were clean and all decorated in a similar style making it feel modern and welcoming. The lodge kitchen and open plan living room were huge with more than enough space for the six of us and a dining table with eight seats. In the kitchen itself there was a washing machine, dishwasher and all the crockery, pans and cutlery we needed. Under the sink we found a dish cloth, tea towel, washing up liquid and a dishwasher tablet. More were available from the resort shop. If you prefer your children to eat with plastic crockery or cutlery then you need to bring this with you. In the living area there were three sofas, a coffee table and a large flat screen TV with Freeview. It was more than big enough to allow the children to play and the adults to relax either on the sofas or at the table. In the summer the living space would extend outdoors onto the communal grass between the lodges. This is where we had a picnic table for al fresco dining. Only the lodges with hot hubs have a small private garden area. Overall I describe our lodge as very spacious, well-equipped and modern. It wasn’t somewhere that oozed character but it was a comfortable base for a fun weekend. 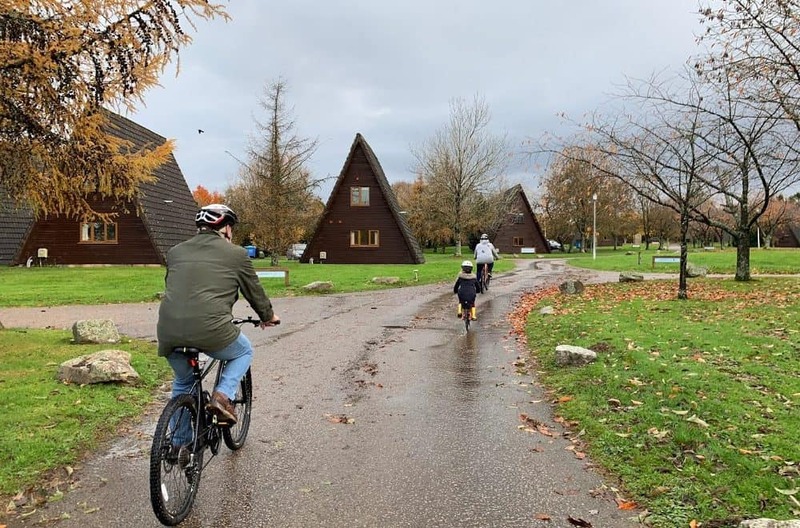 If you’re looking for something a little more quirky then Waterside also as one and two-bedroom teepee lodges, which I thought looked great fun for couples and families. Waterside has a number of lodges with hot tubs. These come with 3-bedroom lodges like the one we stayed in and have a private, fenced off hot tub on a patio at the back. Waterside Cornwall offers a range of activities for lodge guests and members of the public. We managed to fit a few into our weekend break. Activities can either be booked at reception or in the activity hut next to the lake. An activity that we tried for the first time at Waterside was Segways. Mr Tin Box and I had a go first under the instruction of Ant, the owner of Segway Lakeview, who then took Tin Box Nana and Grandad for a whirl afterwards. Ant was an excellent instructor, giving us confidence to try moves I’d not have thought possible an hour earlier. During the tour you go from learning the basics of how to get on and off, to hill ascents and descents, and manuavireng around twisting paths and bumpy ground. You also get some great views of the Cornish countryside from the top of the foot golf course. It’s a lot of fun and works your legs harder than you’d think. However it is an activity for all abilities. If you’ve not tried Segways before then it’s definitely worth challenging yourself – you’ll have a blast. Segway experiences are open to guests and the general public all year round. The youngest age that tours are suitable for is eight-years-old. If you are guests at Waterside a session on the Segways costs £32 for adults and £28 for under 16s. We borrowed some of Waterside’s bikes for a cycle around the resort on the Saturday morning of our stay. The bikes are really good quality and there are sizes for adults and older kids. Five-year-old Tot rode her own peddle bike as there wasn’t anything quite small enough for her. Baby came along for a ride in a tag along that we were also able to borrow. The closest cycle route from Waterside is the Camel Trail. But as getting to this involved riding along a main road we opted to keep the kids onsite. Families with older children might like to plan a day cycling along the Camel Trail which is a 20 minute ride from Waterside. There are three recommended routes ranging from five to seven miles and flat to challenging terrain. A map is available at the activity hut. Cycle hire costs £10 a day for adults, £5 for children’s bikes and £5 for tag alongs. Waterside has a small but delightfully warm swimming pool in its club house complex. This is free for lodge guests to use. You receive a swim timetable when you check in that shows you when there are adult only swims and classes. There’s also a gym timetable with exercise classes that you can book for £3. The changing rooms have lockers (pick up a key from reception) and there are showers. We also spotted a family changing room. Around the back of the club house is a play area with soft outdoor play equipment for very young children as well and things to do for older kids. This can all be seen from the restaurant terrace overlooking the lake, making it easy for parents to sit down for a drink and chat while their children play. Dinner at Three Lakes Restaurant is a must. The menu is reasonably priced for freshly prepared dishes, using seasonal and delicious ingredients. We ate there on Saturday night. The team settled us down with children’s menus for the girls to colour while we had the hard task of picking dishes from the main menu. The good news for families is that children’s meals cost just £4. And if you dine between 5pm and 7pm you can get a kids meal free for every full priced adults meal. I’d have been happy tucking into the burger or cheesy pasta and garlic bread that arrived for the girls at the same time as our starters. Side note: don’t you love it when restaurants instinctively know that kids need feeding quick?! Our meals were well presented and tasted fantastic. The portions were a good size too – only a few of us made it to dessert! OK, it was only me and the kids – I blame them for my sweet tooth! The waiting team we very helpful, making recommendations for side orders and giving us advice on dishes. They also quickly arranged an alternative meal for us when a curry proved hotter than anticipated. Two courses costs £16.95 and three courses costs £20.95 between 5pm and 9pm daily. The next day we returned for the Sunday carvery. At £8.95 for adults and £4.95 for kids it’s great value. There’s a choice of three types of meat with all the trimmings and the biggest Yorkshire puddings I’ve ever seen. It’s obviously really popular with guests in the holiday lodges and locals. Book early as you may not find a table available on the day. As well as dining in the bar area there’s a beautiful conservatory which can be reserved for groups. Or, on warmer days you could have a drink and food on the terrace overlooking the lake. Waterside Cornwall has its own small shop for essential groceries, fresh bread and gifts. As Waterside is so close to the A30 it doesn’t take long to hop back on the main road and go exploring in North Cornwall or South Cornwall. Lands End is just over an hour south west, Tintagel is a 40 minute drive north, and The Eden Project is 15 minutes to the south. If you’re looking for lodges in Cornwall near the beach then Waterside’s closest beach is 12 miles away at Par Sands near Fowey. This is a sandy beach with sand dunes and a large car park. Newquay with Fistrel Beach, Porth Beach, and Mawgen Porth is just a 25 minute drive away. This is a great place for lodge holidays in Cornwall if you are visiting as a family or with a group of friends. 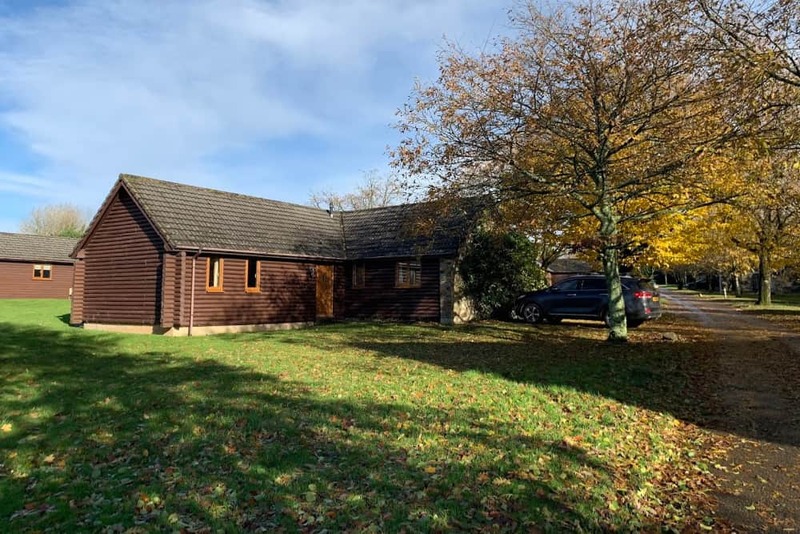 Our lodge was spacious and excellent value for short breaks in winter including up to eight people. A three night stay at Waterside Cornwall in November would have cost £349. See the holiday park website for the latest prices. There’s so much to do on site that we didn’t leave it all weekend. If you did want to explore more of Cornwall then I’d recommend booking a longer stay to get the most out of the resort’s activities too. Disclosure: we were guests of Waterside Cornwall and received our accommodation, activities, Saturday night meal and travel expenses in exchange for a review. All opinions are my own and those of my family. Wow it looks fantastic. I love the sound of the segway tour and that it’s something our whole family (Jack turns 8 next month) will be able to try together. How exciting. Those yorkshire puddings are EPIC and I can see why they’re popular! LOL! There were a few beers over catching up on Saturday night 🙂 You’re going to have a great stay! The lodges are an unusual shape. How cute! This is the sort of place you could just bury yourself into, by the sounds of things. It sounds very reasonably priced, too. Yes, a winter break if there’s a group of you is such good value!